I’ve been thinking about makers who dedicate their lives to one craft exclusively. I admire all those in our shop who specialise, it requires a lot of dedication and I often source inspiration from this attitude and way of thinking. I suppose there’s many negatives to such a career, but there’s also many positive aspects to counteract, not only are you rewarded with a unique skill you’ll also create work that’s meaningful and truly one of a kind. 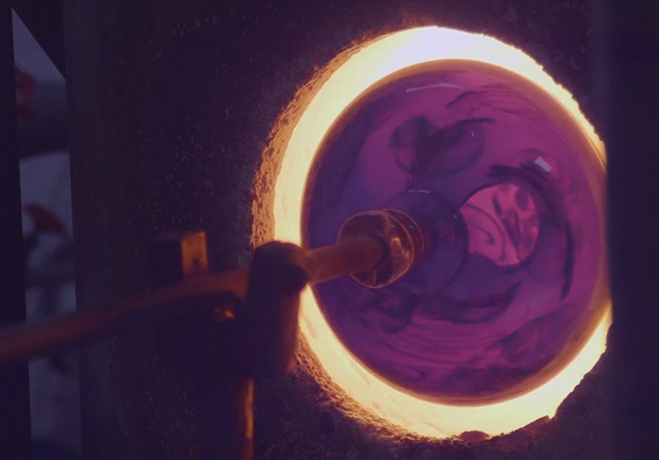 Just watching Bristol based artist G.William Bell in this video below, it’s obvious to see his heart, sweat (quite literally), and tears going in to the production of his glassware. The final set of work is quite mesmerising. They’re large translucent vessels that feature unique swirls throughout, this gives the pieces an “other worldly” dimension. I’ve only seen this technique used in minor detail before, but this video shows how difficult the process is and how it can be achieved by placing coloured blobs of glass on to the vessel and blending it in to the main body. The moving imagery is a perfect illustration of the difficulty of manipulating such a material. Not only is it a tough skill to acquire and requires many years of constant manipulation, it also looks hard on the body and very hot, humid work. To create something beautiful in glass is quite an achievement and I applaud any maker experimenting in this art. Before I see the works of a maker I usually like to see their full range of work, on this occasion I thought I’d jump the gun a little and showcase Bell’s promotional video anyway. I liked his way of working, which looks both fresh and interesting, and it seems like he’ll be one to watch in the coming years in the contemporary glass field. I hope you like this and will bookmark his website as a place to visit later in the year.